Cuisinart dinnerware is made available by Cuisinart. The business has been providing innovative kitchen and dining solutions for over forty years. They are best known for small kitchen appliances, like food processors and waffle makers, but they contribute some awesome dinnerware choices as well. 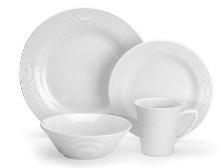 The dinnerware line offered by Cuisinart includes both porcelain dinnerware and stoneware. Most of their patterns fit into the category of casual dinnerware sets, but some of the porcelain patterns ride line between casual and fine dining. Being an "all culinary things" type of place, Cuisinart also offers some pretty awesome choices when it comes to glassware, cookware and flatware. Really, anything that you need for your kitchen, Cuisinart, more likely than not, has a solution. Cuisinart dinnerware can be found in up-scale department stores and specialty stores. Presently produced and discontinued Cuisinart patterns, both new and used, can almost always be found in eBay listings. 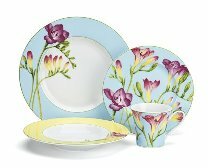 Being the white porcelain dinnerware set girl that I am, I prefer the Marne dinnerware set, but all of the sets by Cuisinart are very appealing. I like the size and shape of the bowl and mug, which is another pet peeve for me. Of the porcelain patterns, the Tille Collection is at the top of my list. It is a vibrant floral pattern that perfectly meshes shades of blue, green, yellow, and purple to create a lively design. 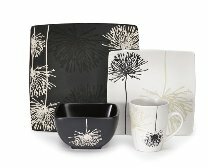 My favorite Cuisinart stoneware pattern comes from the Marianne Collection. The color scheme fits into my decorating style perfectly, and I'm somewhat fond of dandelions. They bring a lot of memories of my childhood. I don't know for sure that the design in the collection is meant to be dandelions, but to me it seems to be inspired by them. I have used several Cuisinart kitchen devices, but I actually was amazed at their selection of dinnerware and tableware accessories. I like the style that Cuisinart makes available to us to spice up our kitchens and dining rooms as well as the ease that their small kitchen appliances and accessories bring to the cooking experience.